Summer has arrived in Cape Town and with it the endless events that happens because December, End of year functions, the beaches, outdoor festivals etc. Did I mention it’s summer? Well getting to and from your favourite events have just become easier with Uber taxis. I’ve been using Uber for about 2 years now and it also started during the summer months. We had some friends over from Jozi and decided to take the Red Hop-on Hop-off busses to show our guests the usual tourist sites. We decided to take the cable car up Table Mountain as a tourist journey in the Mother CIty isn’t complete without it. We got a little hungry and on the way down while still in the cable car I hailed the Uber Black cab to pick us up at the bottom. When we reached the bottom a Mercedes SUV was waiting for our starving selves. It was such a relief not to worry about parking or driving in seasonal traffic. We reached our destination safely thanks to the extremely friendly driver. It was a little pricey because it was Uber Black which is their premium service. Uber have launched Uber X which is the same or cheaper than normal Taxi cabs. Thanks to Uber’s referral program where if you download the app using a friends referral code you would get the first ride to a certain value for free. The good folks at Uber now have a special referral code for all readers of webaddict.co.za. 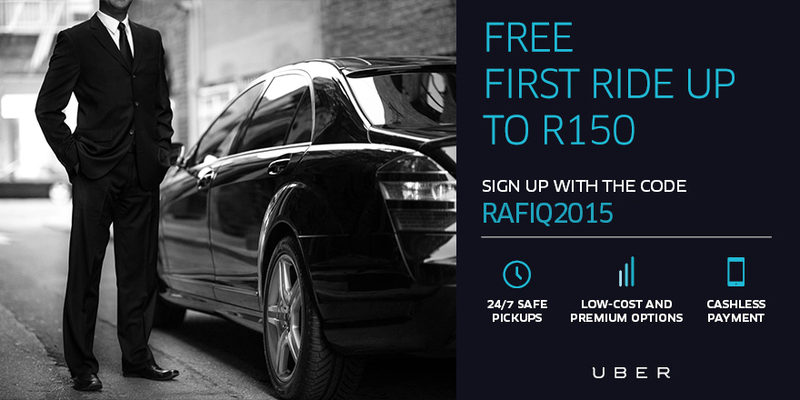 Simply use this link to sign up or the code RAFIQ2015 and get R150 off your first Uber ride. If you are planning a year end function simply share the above code with your guests and all first time riders will get R150 off their first Uber trip. How cool is that in the Summer heat? 📝 Have you thought about... ? 💧Cape Town💧 ? Tried Uber yet?